The Hypothalamus releases GHRH Growth Hormone Releasing Hormone. This stimulates the anterior pituitary gland to release GH Growth hormone which stimulates the metabolism and catabolism of fats and proteins. It also decreases glucose uptake by tissues, which increases blood sugar levels. The anterior pituitary gland also releases ACTH adrenocorticotrophin hormone which acts on the adrenal glands stimulating them to relelase epinephrine which stimulates the metabolism of fats and also stimulates glycogenolysis (liver and muscle). This has the effect of raising blood sugars. The adrenal gland also produces glucocortisoids that stimulate protein metabolism and gluconeogenesis. This has the effect of raising blood sugars. Insulin helps glucose to enter the cells and also stimulates glucose catabolism, both of which have the effect of raising blood sugar levels. 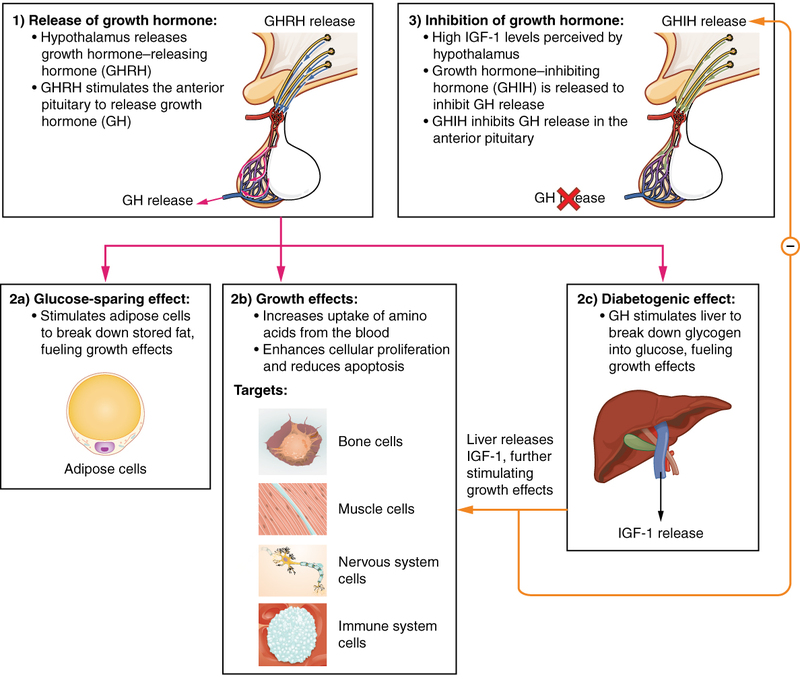 GHIH Growth hormone inhibiting hormone inhibits the release of GH growth hormone by the anterior pituitary gland.